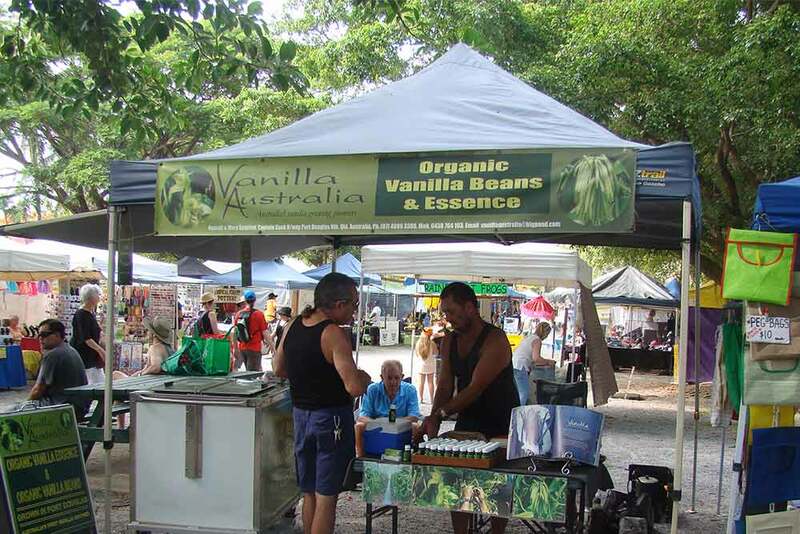 The Mossman Markets are held bright and early every Saturday morning at 7am under the Rain Trees next to St David’s church. You can access the Mossman Markets from the Captain Cook Highway as it heads north to the Daintree from Port Douglas. Across the road from the markets there is a great playground for children, as well as ample car parking and a public toilet. The markets usually close around midday. If you want to mingle with the locals, then the Mossman Markets are for you. Local hobby gardeners and local farmers bring their seasonal produce along to the markets. It depends on the time of year as to what is available, but owing to the excellent climate for growing – there is usually a fantastic selection to choose from. Seasonal tropical fruits available at the markets include dragonfruit, passionfruit, mangoes, lychees, pineapples, longans, rambutans, rolinia, abiu, coconuts, bananas, jaboticaba,sapotes,pomelo and durian. The markets usually have tropical and exotic fruits, fresh vegetables and herbs. There are also cake stalls, clothing stalls and souvenirs. The stallholders at the markets are very friendly folk and are fond of having a chat! This entry was posted in Food, Holiday tips, Produce and tagged explore, Farmers Market, Mossman, tropical fruits.